This post was inspired by my friend Chris. He just moved to Singapore and needed to build his kitchen from scratch. It reminded me of the good old days in Japan, when I had moved into a cozy little studio and gradually built it into a sweet home over the following months. 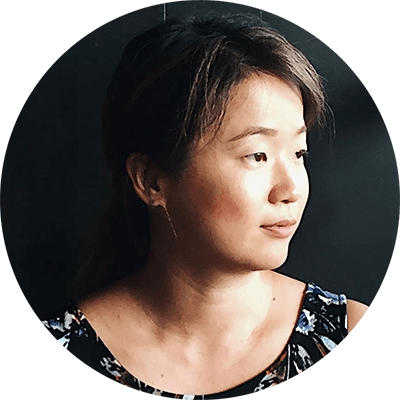 I still remember the first few things I bought the first day I arrived – salt, a dozen of eggs, some bread, vegetable oil, and a nonstick skillet. I was very proud of myself, that on my second day in Japan, I already could enjoy a real breakfast of toasted bread and a nice sunny side up egg at home! Yes, I was picky at breakfast, and I still am. But I admit, a good breakfast with nice cup of coffee will make the rest of every day better, won’t it? Those memories just flew by and I felt the urge to write them down. So I came up with a good idea. 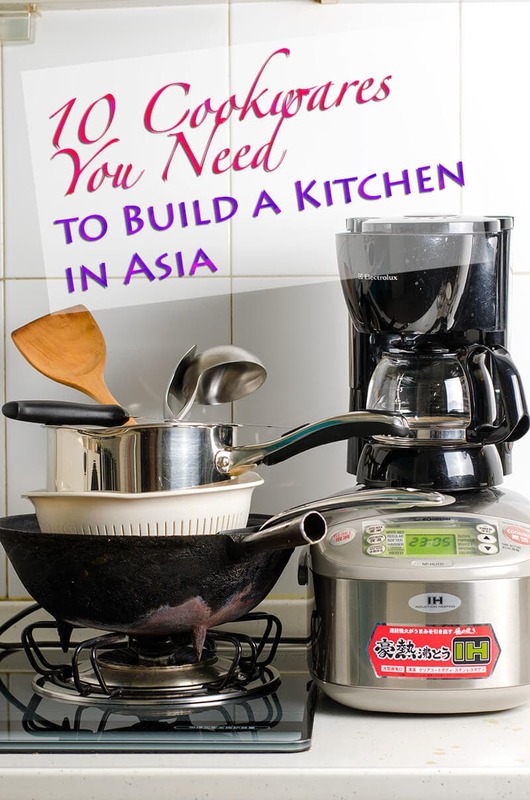 I decided to summarize the most important and basic cookware used in an Asian kitchen, so that if you move to an Asian country some day, this list can help you build a minimum shopping list to get you through the early days, or even early months. Believe me, you can cook so many nice and healthy dishes with this basic cookware, even if you’ve never learned to cook Asian food before. 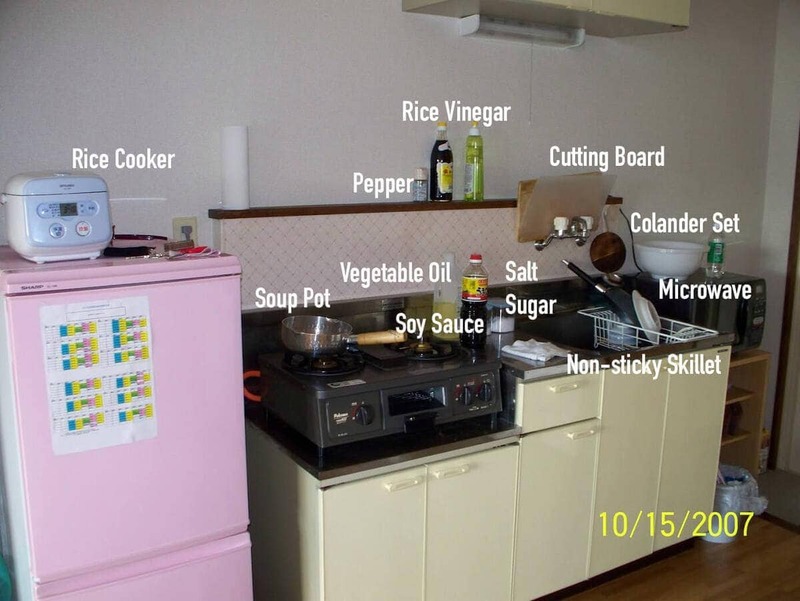 The second reason I want to write this post is that an Asian kitchen is usually very small, even tiny, compared to one in the US. So the first thing you need to consider is, do not buy too many things you rarely use, and learn to use space in a smart way. I found the best way to achieve this is to get all the basic things at first, like those I listed here, then buy a few things at a time, to avoid over-purchasing. 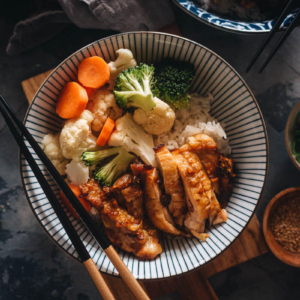 The third reason I made this list is because I want to show you that you can use these very basic kitchen tools to make delicious Asian food. We all love prime rib and very cheesy pizza, but the fact is, most Asian kitchens don’t have an oven, and buying cheese or a nice cut of meat can be expensive. On the other hand, there’s hundreds of new and very delicious foods waiting to be discovered. If you learn to cook a few Asian dishes, it will make your grocery shopping much easier and cheaper. The photo above is of my kitchen after I had been in Japan for two weeks. Back then, I barely knew how to cook at all, but the minimal equipment and ingredients got me through the first four months in Japan. I consider this THE MOST IMPORTANT piece of cookware no matter where I live. This one is mainly for cooking stir-fried food. 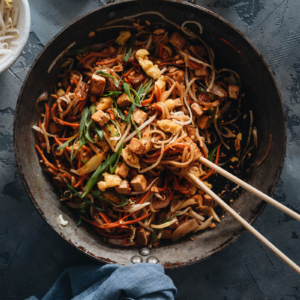 Stir-fried dishes, no mater whether meat, poultry, rice, or noodles, are the fastest and most convenient to cook on a daily basis. I put “or” here, because you can just choose one if you have limited space. A wok is versatile, and you can use it for stir-frying, deep frying, and braising. However, there’s a bit of a learning curve if you’ve never cooked with a wok before. There are some tips for using a wok in this post. Although some stir-fried dishes require a wok for the best results, a good quality nonstick skillet does a good job in most cases. It’s much easier to control, requires less oil, and is very easy to learn. For an example, see this cauliflower dish. This one goes with the wok / nonstick skillet, of course. But I did forget to buy it when I had just arrived in Japan… I used chopsticks to flip the fried egg for my first breakfast… If you use a wok, you should buy a spatula made from metal, which is easy for flipping and scooping ingredients from the round bottom of the wok. If you use a nonstick skillet, use a wooden, plastic, or silicon spatula instead, since a metal one will ruin the the surface of the skillet. This pot is for blanching vegetables, boiling dumplings, and cooking soup and noodles. One of my favorite lazy ways to cook a quick dinner is to boil frozen wontons from the supermarket with several types of fresh vegetables, using chicken broth and spicy oil as the soup base. It’s soothing, delicious, healthy, and filling for a quick dinner. You’ll find so many brands and flavors of frozen dumplings and wontons in an Asian supermarket, and lots of them taste better than those sold in non-Asian markets. 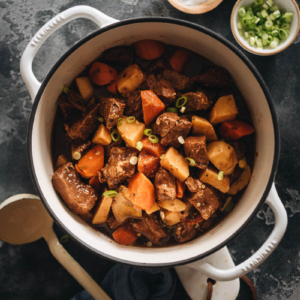 I highly recommend you stock a few bags in the freezer in case you want a quick and delicious dinner on a weekday evening. If you forget this one, you’ll have some major trouble when you cook up a big pot of noodle soup. A sharp, medium-sized knife can help with chopping, peeling, and cutting. You don’t even need scissors. If you decide to cook more often, I recommend you invest in a high quality knife, because an Asian kitchen requires more chopping, slicing, and mincing, especially for smaller ingredients like ginger and garlic. Also, vegetables and meat need to be cut into smaller and evenly sized pieces for a good stir-fry. A sharp knife will save you a lot of time and energy in the kitchen. I always prefer a wooden or bamboo cutting board over a plastic one, especially when it comes to cutting bigger chunks of meat. This is very useful in an Asian kitchen, since you can easily get green vegetables at the market and they’ll need some careful washing before use. It’s also a must-have for draining noodles, pasta, and boiled dumplings. Every Asian kitchen should have one, because you can throw in rice and water and leave it there to cook, then go prepare other dishes while the rice cooker does its thing. Steamed rice is healthy, filling, and goes well with stir fried and braised dishes. Rice is a great replacement for bread in Asia, because it’s cheaper and easier to get. Moreover, you can use the leftover rice for fried rice, pack it for lunch box, eat it for breakfast, or make congee. You can also use a rice cooker to make a single dish meal with vegetables and meat. Some people even use it to make sponge cake. In my world, there are only two types of people, coffee people and tea people. For me, a coffee maker makes every day better from the start. I’m not a morning person, but I grind coffee beans to make a fresh cup of coffee every day. But if you’re a tea person, get the kettle instead, and I won’t judge you. Again, if you’ve got limited space, you might need to choose between these two. Personally, I would choose a toaster oven over a microwave. Because you can heat anything on the stove with a skillet or a pot, even it’s a bit slower than heating it up in the microwave. However, I do need nicely baked pizza, roast beef, and various dishes with cheese on top once in a while. Also, it might be expensive or difficult to get nice western food, depending on where you live. Therefore, a toaster oven is a good choice, if you have urges for home cooked food. If you live in Japan, you might find that most gas stoves come with a tiny grilling space in the middle, like a small drawer. It’s so convenient to grill fresh fish or half a pizza on it. It’s a great substitute for a toaster oven. Above are the most important and basic ten pieces of cookware you need to build a kitchen in Asia. If you also want to look at the basic ingredients for cooking Asian food, you can check my pantry section. What do you think of this list? Leave a comment to let me know if this list is helpful or there’s something missing. Hey Maggie, thanks for keeping me focused. I think my minimalist approach will include all your items since I can only give up so much of my Americans ways. I have a frying pan but the wok sounds like I can get some of that grill feeling I miss, and it’s quick as you say. No smoke detector so that won’t bother during cooking like all my US apartments that require them. Singapore puts bomb shelters in apartments so I have that as a pantry to stuff a few more things. Interesting I’m prepared for an air attack here but not a simple house fire. Glad chicken and pork are cheap at least. Hi Chris, thanks for stopping by and commenting! First time to hear bomb shelter in an apartment, but it sounds like a good storage room for me! So far, I didn’t find smoke detector Chinese apartment, but I remember Japanese apartments have them. It makes me wonder, maybe it’s because Chinese cooking (or wok cooking) is too common in those places, and the smoke it generates will set off the alarm several times a day. Great post! About the coffee person/tea person debate, I’d say the kettle is a good way to go if you like coffee and tea, since you can use it with a french press or Japanese drip bag coffee. It’s also handy for quickly heating water for soup. noodles, or dumplings. Very smart debate! :) Have to admit I have them both at home and a kettle is handy for quick heating up water. Japanese drip bag coffee is the most convenient way to have fresh coffee during a trip, especially in China, that most domestic 5 stars hotels will only offer instant coffee! I’m currently in china and really missing my oven. I was wondering if an oven/toaster will allow me to bake things like muffins, and cakes, or roasting veggies? Back home I had a toaster oven but I never used it for an oven before so I’m not sure if it will be any good. Hi Leyla, I used to use my toaster oven for baking gratin, pizza and roasting fish, and it worked out fine. It really depends on the equipment you have, and a decent size oven always work better than toaster. The electronic oven I’m using now, is one of the biggest one I can find in China so far. It has no problem for baking veggies, meat, muffins and cakes, but have a bit trouble baking Italian style pizza and making certain types of bread, since it only goes up to 220 degrees C (430 F). A smaller and cheaper toaster oven could do almost the same things, but its temperature is a bit difficult to control and it doesn’t hold up heat very well. For example, it will easily result in over cooked surface with the inside of meat is still raw. If you’ll stay in China for quite a long time and need to bake a lot, I’d suggest you to invest a bit more on electronic oven. On the opposite, a cheaper one with decent size will work well enough. Hi Maggie. Thanks for dropping by yesterday, and I’m so glad you did because your blog looks great! I’m excited to explore more Asian inspired recipes. We actually live pretty close to China town in NYC, so it should be relatively easy to find many of the ingredients. However, the only item from the list we don’t have is a rice cooker. Is there anything I should consider when buying one?…as far as functionality. Hi Christine, I’d say a rice cooker is the most important piece in a Chinese kitchen. It’ll be very convenient to have one if you cook Asian food once in a while. My list here is a minimal list. There’s several utensils/tools that are usually used in Asian kitchen, like cleaver (easy for chopping chicken/pork with bones, smashing est. ), clay pot (soup and stew), bamboo steamers (for making dim sum), electric hot pot (great for dinner party), tongs (transfer food from deep-frying or noodles), rolling pins (making dumpling/wonton wrap). I could name a lot, but it really depend on what kind of food you’d like to cook. Really great posts, I will get all these items in my kitchen. Thanks Maggie!! Haha, I share the very similar experience myself. I didn’t know about home store and paid a visit to student who is leaving. I dragged back a few hangers, toilet paper, a broken TV and a worn out skillet with my bike and it was a long ride! A rice cooker is a standard item in almost every house in China and Japan. We almost cook rice everyday, plus it’s fast and easy. And yes, we usually have limited burner, at most 2.